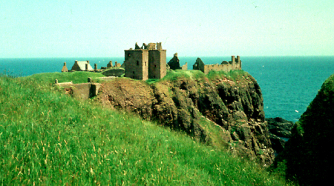 In 1685 a rebellion was expected in southern Scotland so the authorities decided to send the hundreds of Covenanters held in Edinburgh jails north to be held at Dunnottar to prevent them being sprung free. The Covenanters were marched north in dreadful conditions and held in a vault of the castle, later known as the Whig's Vault. A total of 167 Covenanters were held in the single apartment, 122 men and 47 women, which had little access to fresh air and no facilities. A number died, and an attempt at breaking out resulted in some dying. A few Covenanters who died here are buried in nearby Dunnottar churchyard. After a period of confinement, most of the Covenanters were banished to the Americas as slaves.